Dasa Wana Resort is a small resort in Candidasa on the Southeast coast of Bali, with 9 bungalows and / or rooms. The resort is located in a beautiful tropical garden just three minutes from the beach. The deluxe rooms are located in pairs in a detached bungalow. Rooms # 5 and # 6 have a connecting door so that a family room for up to a maximum of five people can be created. All rooms and bungalows are suitable for 2, but # 9 bungalow has two bedrooms and can be occupied by 4 people. All rooms and bungalows are comfortably furnished and equipped with fridge / minibar, safe, coffee and / or tea machine, crockery, air conditioning, and local or satellite TV. In addition, each room / bungalow has at least one terrace with seating. The lush vegetation in the garden provides sufficient privacy on each terrace. N.B. the design and equipment of the rooms / bungalows is different. Photos of all the different rooms and bungalows can be found on the link Photos. Clicking the thumbnails provides an enlarged view. The rooms, most of the bungalows and restaurant are situated around the pool. The restaurant has a beautiful view of the pool and garden. To book a room or bungalow click on the link “BOOK HERE”. By filling in the dates you wish to stay you will immediately see which rooms or bungalows are available. Simply fill in your details and you will be assured of your chosen accommodation. To preview the rooms or bungalows that are available, just click on the link “Photos”. A special room is available where you can get a professional massage. Dasa Wana Resort is easily accessible. A number of taxi drivers selected by us are available to you. They speak good English and can take you anywhere at fixed prices and are familiar with all the tourist spots. It is also possible to travel by public transport. 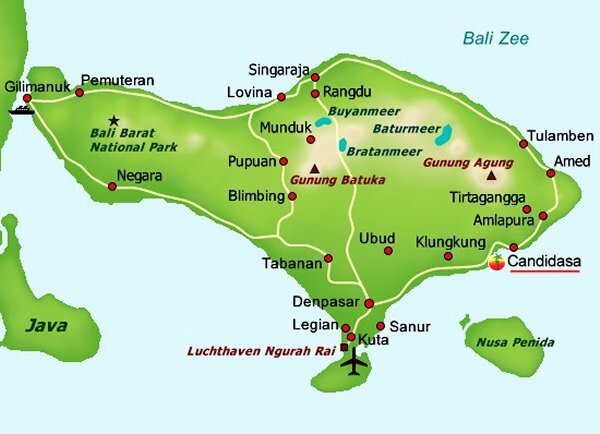 Bemo vans drive through Candidasa and can take you quickly and cheaply to Padang Bai or Amlapura. Finally, the tour operator Perama has an extensive program of tours, but also regular bus connections. They run several times a day between the airport, Sanur, Ubud and Candidasa. Upon arrival at the airport in Indonesia you do NOT need to buy a visa for stays of up to 30 days. For a stay longer than 30 days, you must purchase a visa on arrival. This can be extended once by a further 30 days. If you stay longer, you must apply for a visa at the embassy in your country. Vaccinations against DTP (diphtheria, tetanus and polio), Hepatitis A, if necessary B (jaundice) are recommended. For stays of longer than two weeks in Indonesia vaccination against typhoid is recommended. Consult your doctor or clinic.